The Wild suffered a bit of a blow to its center depth this morning when the Columbus Blue Jackets claimed Zac Dalpe off waivers for the sum of $15,000. Ryan Carter and Teemu Pulkkinen cleared, and the Wild later traded Pulkkinen to Arizona before Wednesday's 2 p.m. deadline. General Manager Chuck Fletcher really hoped Dalpe would slide through waivers, as did coach Bruce Boudreau, who didn't seem too pleased when he was told Dalpe was taken. Boudreau was so taken aback, I wonder if Dalpe was playing tonight vs. the Kings (Devan Dubnyk vs. Jonathan Quick) or maybe there was some other kind of trade in the works that he's aware of. Seemed pretty cryptic and stunned. Maybe somebody's sick? I didn't see Mikko Koivu this morning, and that's pure conjecture. But reporter instinct: It was weird. Behind Dalpe in the minors now is Tyler Graovac, who had a hat trick in yesterday's Iowa overtime loss. Unless the Wild makes a reactionary move now to scoop up a center, the Wild has Charlie Coyle, Jordan Schroeder, Ryan White and Carter who can also play center in a pinch. Dalpe was placed on waivers to reset his waiver clock. He had played nine games. A 10th, and the Wild would have to place him on waivers if it later wanted to send him to the minors. 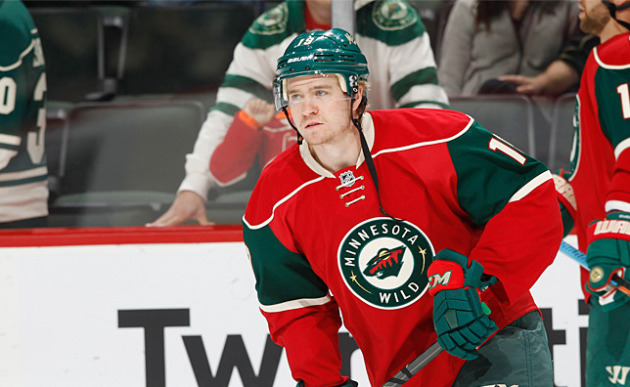 Dalpe's two-year Wild career was full of bad injury luck. He underwent a hip surgery and two knee injuries, playing only 11 regular-season games and three playoff games. He's a former Buckeye, so Columbus should be comfortable, played for John Tortorella in Vancouver and may play the Wild on Thursday. To answer a question a lot of people keep asking: Do I think the Wild's done. I think if the Wild can tinker with the blue line, it will. Fletcher told me he told Shep Harder this morning to let him know exactly how much cap space the Wild has left. Capfriendly.com has the Wild having the ability to add a $2.3 million player or players before the deadline. That's barring a body coming off the Wild roster or the other team retaining money back. So by Fletcher getting Arizona to take half of Hanzal's cap hit, the Wild has room to still do stuff. Martin Hanzal and Ryan White are expected to debut tonight, but they don't get to town this afternoon. Boudreau indicated the lines could have a different look tonight but wouldn't divulge them maybe because he was caught off guard with the Dalpe news. It wouldn't have shocked me if he planned at least to start Hanzal on the fourth line with White just because he didn't practice today, has been flying all day and has had no systems work. This way you could ease in Hanzal, frankly, out of fairness to him. Dubnyk, the ex Coyote, said Fletcher asked him before yesterday's practice what Hanzal was like. Hanzal will wear No. 19 for the Wild because 11 obviously isn't available. That may be an ode to his pal, Doan. We will find out after the game because that will be his first availability to the local media. "He’s a big horse of a guy," Boudreau said of Hanzal. [When I was with the Ducks, Hanzal] played against [Ryan] Getzlaf and did a really good job. He can be physical, he’s mean, he’s got a deft little touch, he’s really good on faceoffs, he was Arizona’s shutdown guy. I think he does a lot of things great, being the size that he is he’s not the fleetest of foot, but at the same time he gets around the ice pretty well." Boudreau said Fletcher identified Hanzal as a guy the Wild wanted before Jonathan Toews lit up Minnesota with five points last week, but "It certainly does help to have two genuine shutdown guys that are playing the position of center and I think that actually makes us as deep as any team in the League in that position." On whether he's concerned this could disrupt chemistry, Boudreau said, "We all have one common goal and that’s to win. We’ve said this all year long that we don’t have four superstars on this team. We’re all in this together, so I think the fact that we made ourselves better and the fact that it’ll help us be a better team will get everybody on the same page. I think it’s not a question of spreading minutes around, I think we do a pretty good job of that and I don’t think that will change, but I think these guys both coming in want to win as well so I think they both will jump right in." Hanzal is a solid penalty killer, but like Jared Spurgeon told me, he's a "huge" net-front guy. So with the Zach Parise-Eric Staal-Charlie Coyle power-play unit all dried up, I wonder if Hanzal eventually goes to that unit, maybe takes Coyle's spot. "I don’t know," Boudreau said. "I guess we’ll see how that goes. Obviously we’d like both units to be going really good. Mikko’s unit is pretty hot as of late, the other group is not, but also it gives you an option that’s for sure." Asked if he thinks the move will energize the team, Boudreau said, "It energizes the coach. I don’t know if it energizes the players, I hope it does." Asked if this moved Erik Haula full-time to the fourth line eventually, Boudreau said, "Long-term, I guess fourth line, first line, it all depends on how we’re playing. I’ve got no problem moving guys that are playing really good up and guys that are playing really bad down, so I think it gives us great balance and I’m a firm believer that you have to have four lines to be successful and this certainly gives us 12 NHL forwards." On the trade, Chris Stewart said, "There is no time like the present for this group with the way we've been playing. We don't know when we're going to get another opportunity like this. [Fletcher's] giving us a chance. It's up to us to do it." Stewart said, "The top three centers on this team have an average height of 6-foot-5 and at least 220 pounds. That's going to be tough to play against. [Hanzal] definitely brings that physical edge to the game. He's pretty good offensively too. I think he'll fit in here well. "He's really good on faceoffs. He has an undercover mean streak too. You don't really notice until he's there in front of the net. He takes pride in the way he plays. I think he's going to be excited to be here." Eric Staal said, "I think with the way we've played this season has helped and put us in a position to be able to do something like that. Obviously Chuck making a move like that is a good feeling for this group. We are excited about adding to what we've already got going on here. We have to do the same things we've done all season. We have to get back on the horse here tonight and adding those two guys is definitely not going to hurt. They are strong, big, tough guys. That's been our matchup for the most part this entire season." Staal said Hanzal "is a tough guy to play against. You line up against a guy that's 6-foot-5 and big and strong and that can get difficult as the night goes on and through the course of a playoff series. It's nice to be able to add that to what we've already got going here down the middle. We have some big, strong guys that can lean on people and make it tough to play against. We are excited to have him and Whitey join us." On tonight, the Wild hasn't lost consecutive games in regulation since Nov. 1 and 5 or consecutive games since Nov. 29 and Dec. 2. The Kings are very desperate. The Blackhawks are now one point behind Minnesota, although the Wild has three games in hand. "They know that every team that’s in the West keeps winning," Boudreau said of his group. "Calgary is winning, Nashville’s winning, so we’re playing a desperate hockey club and I know exactly how good they can be when they’re desperate. They’re not going to cheat the game one iota. If we’re not ready to play our best game coming out of the break in awhile, then we won’t be very successful." The Wild’s franchise-record-long eight-game homestand (4-2-1) comes to an end with the front end of back-to-back home/road games; the Wild plays in Winnipeg on Tuesday. The Wild’s coming off its five-day “bye.” Teams coming off their bye are 7-15-4 (4-11-3 in February). The Kings, outside the playoff bubble, have lost six of nine but are coming off a big win over Anaheim. The Wild is 4-0-2 in its past six vs. the Kings. The Wild is 13-6-4 in its last 23 games against the Kings with six of the games decided in a shootout. The Wild’s 13-4-4 in its past 21 meetings with L.A. at home. … The Wild leads the Western Conference with 195 goals scored and 3.31 goals per game; the Kings rank 25th in the NHL at 2.44 goals per game. Jason Pominville has 20 points in the past 16 games. Since becoming a line Nov. 25, Jason Zucker-Mikko Koivu-Mikael Granlund has a combined 45 goals, 69 assists and 114 points. Koivu has 33 points in 35 meetings with L.A. Granlund leads the Wild with 14 multi-point games. He has 24 points in the past 20 games. Anze Kopitar leads the Kings with 29 points in 38 games against Minnesota. Jeff Carter is tied for second in the NHL with 30 goals. Marian Gaborik is the Wild’s all-time leading goal scorer, but he was a healthy scratch Saturday. I'll be on NHL Network at 5:40 p.m. CT. Poll: What do you think of the Wild's trade with Arizona?